HoundMouth. From the Hills Below the City. Houndmouth is another Southern Indiana band that’s worth it’s weight in native North American black gold. While their geographic origins may be similar to Reverand Peyton’s Big Damn Band, you won’t mistake the sounds for one another. Less rockabilly, and more classic rock, this band named after the unplanned accompaniment during an early recording session pulls out all the stops to bring a beauty to the grit of modern working class life stories. They’ve been positively reviewed by The Guardian, NPR, and are performing at Newport Folk Fest later this season, after a short two years together. Their debut full length album, From the Hills Below the City, joins their self-titled EP as new classics that deserve your attention. Some of Houndmouth’s songs are reminiscent of The Band and Bob Dylan, but updated with a slightly edgier bite. The occasional jumpy beat can make you get up and dance, even as your house is threatened with foreclosure as songs like Casino (Bad Things) remind you that it can always be worse. Katie Toupin is one of those non-classic female lead vocalists that I would put money on her having a solid career ahead of her. It’s not sweet and sassy, but more rugged and passionately wearied. The instrumentation throughout is beautiful and essentially consistent across the album. Normally I love variety, but the cohesiveness of From the Hills Below the City is irresistible in this case. A lot of these songs speak of the road or travelling, and that theme of transience and impermanence is one that seems all too familiar currently. It’s rare to find someone under forty or so who’s stayed in one geographic community for a majority of their life, as school, jobs, and careers take people from one place to another far more often today, so it’s not surprising that these songs play well. The Penitentiary stands out as almost Johnny Cash in spirit, if not sound, as it speaks of imprisonment and the feelings that imprisonment brings about. Even with a classic Americana note, these songs are still up to date enough to resonate with today’s audiences, as Casino (Bad Things) makes reference to freebasing, for example. Ludlow Bay is among the working songs on the album, asking “Where did all the workmen go? Sure ain’t down in Ludlow.” Hey Rose has a great honky-tonk bar feel, with heavy four on the floor and guitar, and highlights the appealing faint echo that appears to be a relict of there recording venue. For a stand out piece, Krampus has a nearly hymnal quality speaking of light, winter, and going home, all of which make Krampus welcoming to most people. 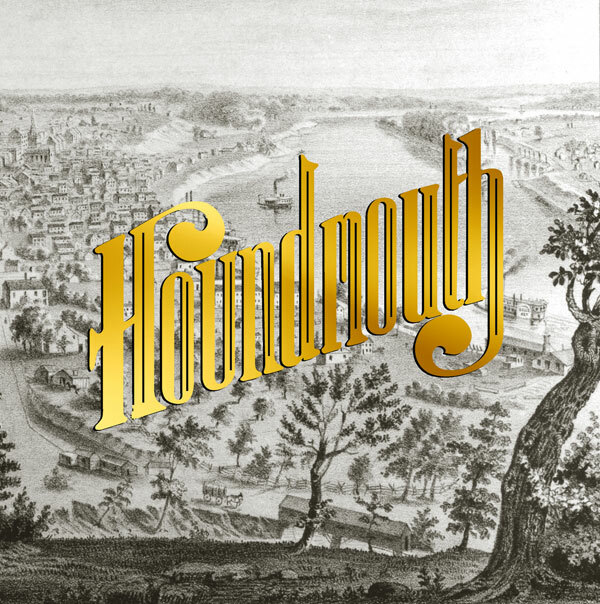 Admittedly, we aren’t the first place to review Houndmouth, but if you haven’t heard of them until this, I hope that you’ll check them out. High quality groups of balanced talent never go out of style, and Houndmouth has enough similar sounds to other artists on Ear to the Ground that just about anyone reading here will probably at least be able to appreciate From the Hills Below the City. Whether or not you get to do many festivals this season, try to check out Houndmouth if you’re in their vicinity. I can only imagine how they might sound live, and have trouble imagining that experience being less than spectacular. If you’re in NEO, they’ll be playing the Beachland Tavern on June 29th.